The past couple of days I've been surfing the net for our interior door furniture. I want to really get this right and find a good solid, and attractive knob, set let's go with set. There's not really a polite way of saying that! I have already specified our hardware, but after discovering the cost of $275 a set I'm looking for something at least half price! I have quickly found Australia doesn't do the finish I want. Surprise, surprise Laura wants something more. When we moved in all the doors had builders' standard plated shiny brass levers. But I found this picture...and I'm sold. It's a satin brass, and it's unlacquered - which is still stupidly uncommon here. Leaving it unlacquered will allow it to patina. Beautiful. I also really like the soft shape of the knob and the sharp lines of backplate. It looks like it would sit nicely in your hand. (get that mind out of the gutter) That's because it's custom isn't it, which means it would cost a bomb. 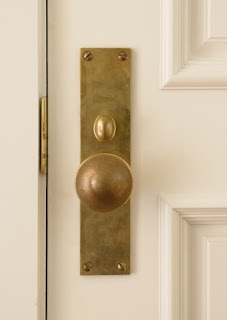 So to find a satin brass finish here? Well, I might be in luck because a UK company called Frank Allart & Co do this finish and they have suppliers in Melbourne! I'll just have to settle for one of their standard shapes to keep the costs down. The other thing I've been deliberating about is our open plan space at the back and the doors that open out onto our outdoor BBQ area. We have a 6m space for this span of doors. For some reason I have a thing against bifold doors. I don't know why, maybe because there's so many cheap & nasty ones out there. I've seen a few 5cm gaps in my time. So I was planning on doing BIG modern sliding doors, 2 maybe 3 panels. They seem more secure to me. But I just keep thinking all our other windows are lovely long elegant shapes with transom fanlights above, would a wall of giant doors look out of place? In 10 years would it look like a dated renovation? 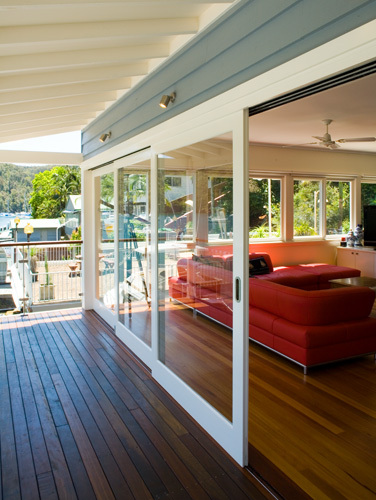 I'm slowly eating my words about those bifold doors now. I think the proportions of them would suit the house better. They're absolutely not as trendy. But it's not about that. This house has to last the test of time. At least there are some super systems out now that are fantastic. 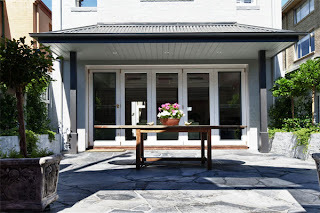 Ideally a few sets of french doors would look best, but to get the flow outside I want the whole wall opened up. Hmmm. The sliding doors might be given the boot me thinks.